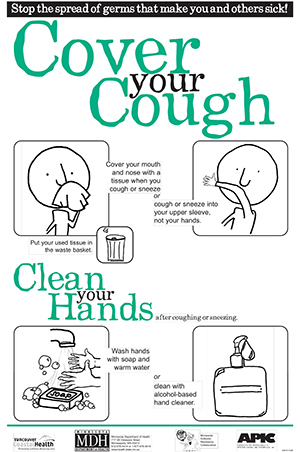 You can help stop the spread of germs that make you and others sick by practicing good cough and sneeze etiquette. Always cover your mouth and nose with a tissue. Throw the used tissue into a garbage can. Then wash your hands using either soap and water or a hand sanitizer. If you don’t have a tissue, cough or sneeze into your sleeve not your hand! Germs on your hands can enter your body through the mucous membranes of your eyes and nose. Wash your hands with soap and warm water. Or clean with an alcohol-based hand sanitizer. Learn how to wash your hands.